★Multi-Application: Our pet grooming tool not only works as a dematting brush or detangling comb, also can be used as an undercoat comb or deshedding rake. ★Comfortable and Safe: Round shape teeth is able to groom the undercoat well without scratching your pet\'s skin quickly. Not only can be used for groomming/deshedding safely, aslo can provie massage service,making your pet enjoy being brushed, increasing blood circulation and leaves your pets coat soft and shiny. ★Far Away from Flea: Comb your pet\'s hair regularly to provide him or her with itch-free relief the safe, easy & natural way. The other side of the Poodle Pet flea comb with handle features closely spaced steel teeth that are best for eliminating flea eggs that have been laid on your dog or cat\'s skin. ★Humanized Design: A brush has different number teeth in double side can be widely used for any different case. 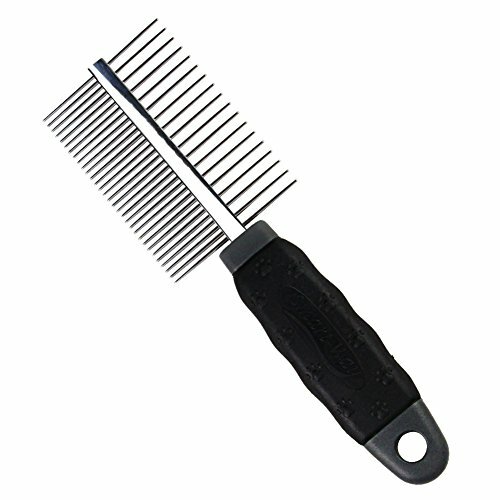 Aslo this pet comb is designed with a comfort-grip that conforms to your hand. ★More Details: Exceptional quality stainless steel for comb teeth and soft handle, total length--17.5*5.2cm, double teeth.